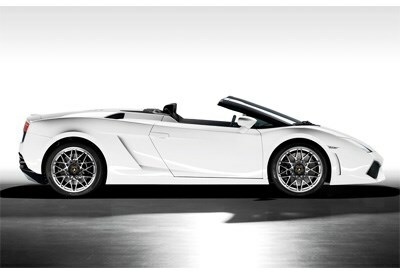 What is it: The Longitudinale Posteriore (longitudinally placed in the posterior) 560 horsepower through four wheels Gallardo (no wonder it's shortened) without a roof. Features a worked version of the redeveloped 5.2L V10 developing 412 kW at 8000 rpm versus the standard car's 382kW (and Superleggera's 390kW), setting a claimed 0-100km/h sprint of four seconds flat. Also features intricate alloys, angular bodykit and fibrous interior trim a la LP640 Murcielago. Also-shows: A Lamborghini Miura will feature at the Historic Tribute display.